Know the Farmer that Grows your Food… And your Flowers! Borden organic farm was established in 1996 by Guy and Lynn Borden. A passion for quality drives our commitment to grow the finest and freshest flowers, herbs, and organic produce for our customers. Our love of the land and appreciation of great food inspires us to farm with the same care that you would take in your own backyard garden. Located on the Western Slope of Colorado, Borden Farms is situated in the fertile Uncompahgre Valley in the historic farming community of Pea Green. At an elevation of 5,423 feet, the warm summer days and cool nights combine with a fertile, sandy loam soil to provide ideal conditions for growing. From a modest beginning, we have grown each year to 14 acres of field production and over 13,000 square feet of flowers, herbs and vegetable plants in our greenhouses. Our fresh, organic vegetables, fruit and culinary herbs are hand-picked in the field at the peak of flavor and nutritional value. 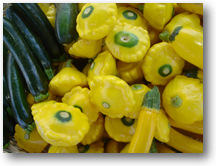 Their beauty and great taste are a treat for the palate and a pleasure to prepare. We offer a wide selection of gourmet vegtables, and are best known for the amazing sweet taste of our famous “Borden’s Best” Homegrown Tomatoes. 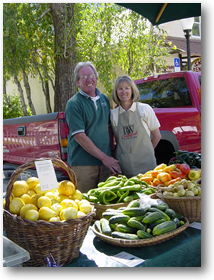 During the season, our great tasting produce is available at our family farm and multiple western slope locations through our CSA. You’ll find us at popular Farmers’ Markets in Carbondale, Aspen, Telluride, Edwards and Crested Butte. And, we are proud to be featured on menus of several fine restaurants including Sweet Basil in Vail and Splendido in Beaver Creek. And We’re Growing with Flowers! We began in the plant business twelve years ago by growing our own vegetable, flower and herb transplants for the field. When we took our “extras” to market, we were amazed at the demand! Our customers loved the choice of big, healthy plants, and our experience in the field helped guide them to success in their home gardens. 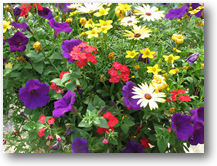 Today, along with a large selection of culinary herb plants, we offer beautiful custom hanging baskets and containers featuring premium “Proven Winners” flower varieties for superior color and performance. Custom designed for our Colorado climate, our beautiful and distinctive flower baskets brighten porches and patios in the high country from spring through fall. Full, mature baskets are available in May at the farm, at our Flower Stand in Montrose, and at Farmers’ Markets in June and July. We hope that you will enjoy the beauty of our flowers and the old-fashioned flavor of nutritious, fresh food like our grandparents used to grow.